Referring of CMS pages, Products and Category pages allows your customers to tell all their friends about any page on your website. 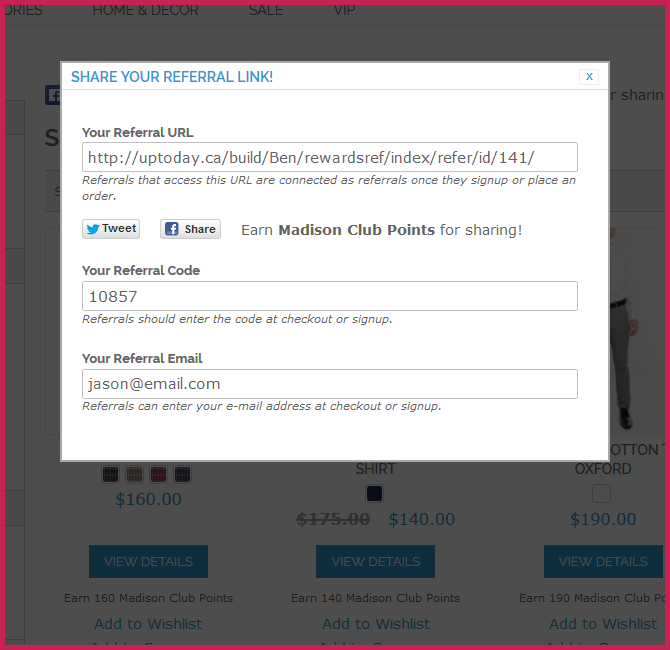 Using the ‘Refer a Friend’ pop up modal they can access their referral URL and Code. These can then be shared out to their network of friends on either ‘Facebook’ or ‘Twitter’. Having good reward bonuses for referring is a great way to drive more traffic, sales and helps build on your SEO (search engine optimization) back-linking strategy. Your customer can share any website URL page using the Facebook Share. Sharing a URL via Twitter will allow your customers to send a Tweet to their followers.